HealthAlliance of the Hudson Valley is here to help YOU. As part of the HealthAlliance of the Hudson Valley’s commitment to providing quality, patient focused and compassionate care, we strive to help our patients understand our billing process and payment policies. As a result, we’ve provided a blank bill with definitions (in red) for each section to help you better understand your bill. The HealthAlliance of the Hudson Valley hospitals appreciate your cooperation with our payment policies. Complete and accurate information should be presented at the time of registration. If insurance information cannot be provided at that time, patients should contact the Central Registration Department at 845.334.4259, as soon as possible. Upon discharge, the hospital will bill your insurance carrier for covered services rendered. Depending on what services you receive from the hospital, you also may receive a separate bill from your private physician, specialist, radiologist or laboratory. Learn more about this in the HealthAlliance Disclosure. Visit our insurance information page for more details and a list of insurance providers accepted by HealthAlliance. View your hospital bill online here. 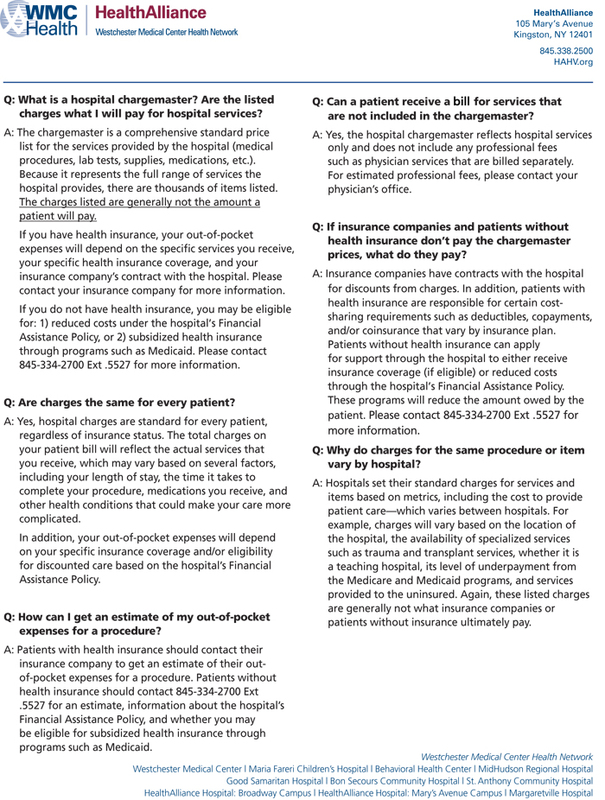 If you don’t understand your bill, we’ve provided a document on how to read a HealthAlliance Hospital bill as well as a consumer guide to healthcare prices from the Healthcare Financial Management Association. You can also pay your bill online. HealthAlliance of the Hudson Valley is committed to being transparent about our charges. The documents below contains the charges for all services and items provided by our hospitals. The charges are uniform for all patients served by the hospitals. The comprehensive list of DRGs provided at Westchester Medical Center is based on FY2016 data from the Centers for Medicare & Medicaid Services’ Input Utilization and Payment Public Use File, which is the most recent available. Co-pay or deductible responsibilities should be paid on the date of service. We accept Visa, Discover, MasterCard and American Express. Our Patient Accounting Department is open 8:00 a.m. - 4:00 p.m., Monday - Friday, in order to assist our patients with resolution of their open accounts. Appointments can be scheduled to speak with one of our representatives outside of our normal hours upon your request. All information is kept confidential. For assistance, please contact the Patient Accounting Department at 845.334.2743. We understand the difficulties surrounding healthcare costs, that’s why we offer financial counseling, charity care and payment assistance to our patients. For more information, visit our financial assistance page. For more information, please view our Credit and Collection Policy for Self Pay Balances.